This is a video that every American must watch. In his amazing and courageous speech on the floor of the US Senate, Vermont senator Bernie Sanders plainly describes the war that is being waged against the middle class by the super-wealthy elite. And while you’re at it, read his revelation about who got the bailout money: A Real Jaw Dropper at the Federal Reserve. It’s nothing short of wholesale looting of the American people by the banking establishment. After years of stonewalling by the Fed, the American people are finally learning the incredible and jaw-dropping details of the Fed’s multi-trillion-dollar bailout of Wall Street and corporate America. We have learned that the $700 billion Wall Street bailout signed into law by President George W. Bush turned out to be pocket change compared to the trillions and trillions of dollars in near-zero interest loans and other financial arrangements the Federal Reserve doled out to every major financial institution in this country. Among those are Goldman Sachs, which received nearly $600 billion; Morgan Stanley, which received nearly $2 trillion; Citigroup, which received $1.8 trillion; Bear Stearns, which received nearly $1 trillion, and Merrill Lynch, which received some $1.5 trillion in short term loans from the Fed. 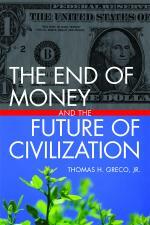 As I argue in my new book, The End of Money and the Future of Civilization, enabling governments to spend more than they take in is half of the purpose of the central banking regime, the other half being to give the banking elite the privilege of charging interest on the people’s own credit. As Bonner further points out, “Of course, the Fed will not want to do such a dastardly deed; but it will do it anyway.” They are desperate to keep the game going and the only other alternative is to let interest rates rise as government seeks to sell more of its debt to increasingly reluctant lenders abroad. Government, for its part, must either cut its profligate spending or raise taxes, or both. From the rhetoric coming out of Washington, it is clear that social programs, like Social Security and Medicare, are on the chopping block, but not sacred cows like military spending or bailouts for banks and corporate dinosaurs–the empire must be preserved. Trial balloons for new taxes are now being floated. Is a VAT (value added tax) on the horizon? As in the Weimar Republic between the World Wars, the politicians and bankers today may decide that hyper-inflation is the least onerous of their available options. The middle-class can say goodbye to their hard-earned savings.